Weighing in at 160,000 lbs., and towering 110 feet above the forest floor, the Dahlgren’s Berger Yarder Tower is the second largest yarder tower in the world. This heavy-duty tree hauling machine is equipped with a back-up camera system, a 48,000 lb. tower that extends from 78 feet to 110 feet long and a main cable drum that houses 5000 feet of 1.5 inch diameter cable. The tower also has a completely unique feature: it can be operated from two separate stations, making control a priority in its challenging tree hauling task. The tower is key for the Dahlgren’s out in the field, and when it came time for a repower, a Detroit Diesel S-60 from Pacific Power Group was the premier choice to power this legendary piece of equipment. Hauling heavy trees from the forest requires an engine that can handle heavy stress and long operational hours, making Detroit Diesel engines from Pacific Power Group perfect for the job. Detroit Diesel engines are renowned for their exceptionally reliable performance and superior construction, making them well suited to the challenging conditions in western Washington. The 630 hp S-60 remanufactured engine selected for this tower provides the performance, smooth operation, low maintenance and extreme power and torque that will be required for this application. With the power from the Detroit Diesel engine, the Berger yarder tower is well equipped to take on the tough terrain around Forks, Wash. The Berger Yarder Tower is in its final testing phases and is on course to be back to work in early 2017. The Dahlgren family has a long history in the Pacific Northwest. With decades of logging under their belt, they know the craftsmanship, hard work, long days, and tough equipment that it takes to get the job done. The Dahlgren’s family hauls approximately 17,000 log truck loads out of the Olympic Peninsula each year, making a dependable partner for machinery power essential. Over the years, the Dahlgren family has trusted the success of their yarders and logging equipment to Pacific Power Group. 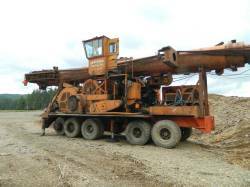 “Our partnership over the years has helped the Dahlgren family and their logging machinery operate more successfully. We’re proud to have them as a customer,” said Joe Grycko, Industrial Engine Sales at Pacific Power Group. No large yarder towers have been built since the mid-1960’s, making repowers vital for logging operations. In recent years, five of the Dahlgren’s machines have been repowered with remanufactured Detroit Diesel Series 60 engines and several also with remanufactured Allison transmissions from Pacific Power Group. Currently, our team is working on a repower of a Mark IV yarder tower that is over 100 ft. tall. 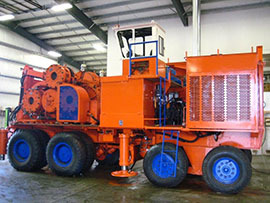 In order to help the Dahlgren’s get the most from their yarder, our team worked with Detroit Diesel to design custom controls for two operation stations, one for driving the massive machine and a second for operating the tall tower.